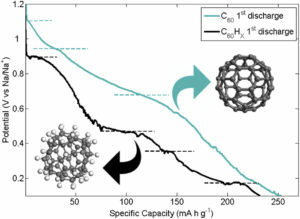 We report on the ability of fullerene C60 and hydrogenated fullerene C60Hx (x∼39) to operate as negative electrodes in novel Na-ion batteries. Building upon the known solubility of C60 in common organic electrolytes used in batteries, we developed a suitably optimized solid-state Na-(polyethylene oxide) electrolyte for this application. Electrochemical and structural properties of the fullerene electrodes were investigated through cyclic voltammetry, fixed-current charge/discharge of the electrodes, impedance spectroscopy and powder X-ray diffraction. Both C60 and hydrogenated C60 have been electrochemically intercalated with sodium. Specific capacities after the first cycle are 250 mAh g−1 and 230 mAh g−1 for C60 and C60Hx respectively. However, C60 electrode shows a strong irreversible character after the first discharge, probably due to the formation of stable polymeric NaxC60 phases, where Na+ ions diffusion is hindered. On the contrary, C60Hx displays better reversibility, suggesting that hydrogenation of the buckyball could be effective to preserve sufficiently large interstitial pathways for Na+ diffusion upon intercalation. This entry was posted in Batteries, Energy Storage, Fullerenes. Bookmark the permalink.